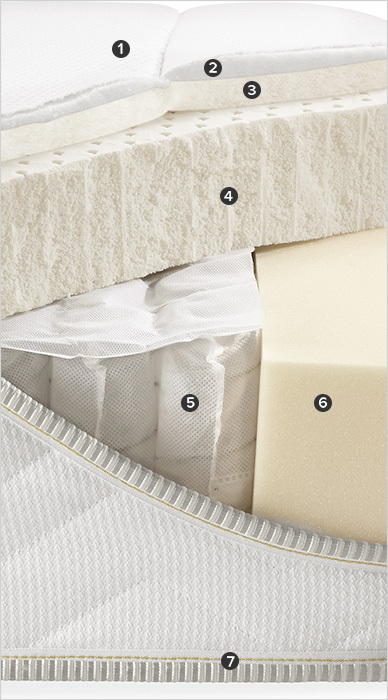 Our private-label Encased Coil with Natural Latex Foam mattress brings together the buoyant feel of coil support with the all-natural comfort of organic latex foam. Independent, wrapped coils provide proper orthopedic support and isolate movement so you and your partner can sleep undisturbed. Pure wool and organic latex with no synthetic fillers cradle your body to further reduce partner disturbance. This combination of materials is naturally anti-microbial and anti-allergenic and helps those with allergies or chemical sensitivities rest easy.